For other people named Paul Chambers, see Paul Chambers (disambiguation). 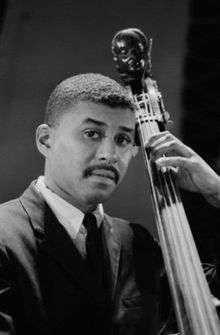 Paul Laurence Dunbar Chambers, Jr. (April 22, 1935 – January 4, 1969) was a jazz double bassist. A fixture of rhythm sections during the 1950s and 1960s, his importance in the development of jazz bass can be measured not only by the length and breadth of his work in this short period but also his impeccable time and intonation, and virtuosic improvisations. He was also known for his bowed solos. Chambers recorded some dozen albums as a leader or co-leader, and prolifically as a sideman notably as the anchor of trumpeter Miles Davis's "first great quintet" (1955-63) and with pianist Wynton Kelly (1963-68). Born in Pittsburgh, Pennsylvania on April 22, 1935, to Paul Lawrence Chambers and Margaret Echos. He was raised in Detroit, Michigan following the death of his mother. He began playing music with several of his schoolmates; the baritone horn was his first instrument. Later he took up the tuba. "I got along pretty well, but it's quite a job to carry it around in those long parades, and I didn't like the instrument that much". Chambers became a string bassist around 1949. His formal bass training got going in earnest in 1952, when he began taking lessons with a bassist in the Detroit Symphony Orchestra. Chambers did some classical work himself, with a group called the Detroit String Band that was, in effect, a rehearsal symphony orchestra. Studying at Cass Technical High School off and on from 1952 to 1955, he played in Cass' own symphony, and in various other student groups, one of which had him playing baritone saxophone. By the time he left for New York City at the invitation of tenor saxophonist Paul Quinichette, he had absorbed a working knowledge of many instruments. Jazz bass players were largely limited to timekeeping with drums, until Duke Ellington's bassist Jimmy Blanton began a transformation in the instrument's role at the end of the 1930s. Chambers was about 15 when he started to listen to Charlie Parker and Bud Powell, his first jazz influences. Oscar Pettiford and Ray Brown were the first bassists he admired, and these were followed by Percy Heath, Milt Hinton and Wendell Marshall for their rhythm section work, and Charles Mingus and George Duvivier for their technical prowess and for their efforts in broadening the scope of jazz bass. Blanton was his all-time favorite. Playing his first gig at one of the little bars in the Hastings Street area, he was soon doing club jobs with Thad Jones, Barry Harris and others. From 1954 on through 1955, he gained significance touring with such musicians as Bennie Green, Quinichette, George Wallington, J. J. Johnson and Kai Winding. In 1955 he joined the Miles Davis quintet, staying on with the group until 1963 and appearing on many classic albums, including Kind of Blue. One of Chambers's most noted performances was on that album's first track, "So What", which opens with a brief duet featuring Chambers and pianist Bill Evans. The sessions for Kind of Blue were challenging for all of the musicians, working to the peak of their musical abilities. Chambers' contribution on Kind of Blue is considered to be some of the most rhythmically and harmonically supportive bass playing in the history of jazz. From 1963 until 1968 Chambers played with the Wynton Kelly trio. He freelanced frequently as a sideman for other important names in jazz throughout his career. During the course of his lifetime Paul Chambers developed addictions to both alcohol and heroin. On January 4, 1969 he died of tuberculosis aged 33. Chambers' accompaniment and solos with Davis and other leaders remain distinctive and influential. He and Slam Stewart were among the first jazz bassists to perform arco or bowed features. From his role in the Davis band, Chambers was the bassist in two rhythm sections. The first, with Red Garland on piano and Philly Joe Jones on drums, came to be known as "the rhythm section," that name featured on a celebrated album by saxophonist Art Pepper, Art Pepper Meets the Rhythm Section. The second, with Wynton Kelly and Jimmy Cobb, made many sessions as a unit, recording albums with John Coltrane, Wes Montgomery, the celebrated track Freddie Freeloader in Miles Davis' Kind of Blue, and by themselves under Kelly's name in albums such as Kelly Blue. Paul Chambers was in great demand as a session musician, and played on numerous albums during the period he was active including such landmarks as Thelonious Monk's Brilliant Corners, Coltrane's Giant Steps, and Oliver Nelson's The Blues and the Abstract Truth. Many musicians wrote songs dedicated to Chambers. Long-time fellow Davis bandmate, pianist Red Garland, wrote the tune "The P.C. Blues", and Coltrane's song "Mr. P.C." is named after Chambers. Tommy Flanagan wrote "Big Paul", which was performed on the Kenny Burrell and John Coltrane Prestige 1958 LP. Max Roach wrote a drum solo called "Five For Paul", on a 1977 drum solo LP recorded in Japan, and Sonny Rollins wrote "Paul's Pal" for him as well. "[T]he first guy who was really distinctive to me — when I was 19 or so — was Paul Chambers, who I heard on all those Prestige and Riverside records. There’s an underrated player! He had a way of playing chromatic notes in his bass lines that was just unreal. He would go up into the high register, and then skip down, tying it together… He had this great sound, and this great time." 1 2 3 4 Yanow, Scott. "Paul Chambers Biography". AllMusic. All Media Network. Retrieved 28 August 2016. 1 2 3 4 Davis, John S. (2012). Historical Dictionary of Jazz. Rowman & Littlefield. p. 64. ISBN 0810867575. Retrieved 2013-11-09. ↑ Coryat, Karl (1999). The Bass Player Book. Hal Leonard Corporation. p. 210. ISBN 0879305738. Retrieved 2013-11-09. ↑ "Chambers, Paul (Laurence Dunbar, Jr.)". jazz.com. Retrieved 2013-11-09. ↑ "Miles Davis: 'Kind of Blue'". NPR. 1 August 2001. Retrieved 2013-11-09. ↑ Ethan Iverson (March 2008). "Interview with Charlie Haden". Do The Math. Retrieved 18 November 2016.